Sam Miller, 84 years old, was the driver as Hay George won at Shenandoah Downs. Photo by Dee Leftwich. Chuck Perry connected for a natural driving hat trick for the third straight race day and track record holder John’s Dream was dominant in the feature once again, but the highlight of the second weekend of racing action at Shenandoah Downs, in Woodstock, VA, was when 84 year old driver Sam Miller directed Hay George to a come-from-behind win in Sunday’s $3500 tenth race. 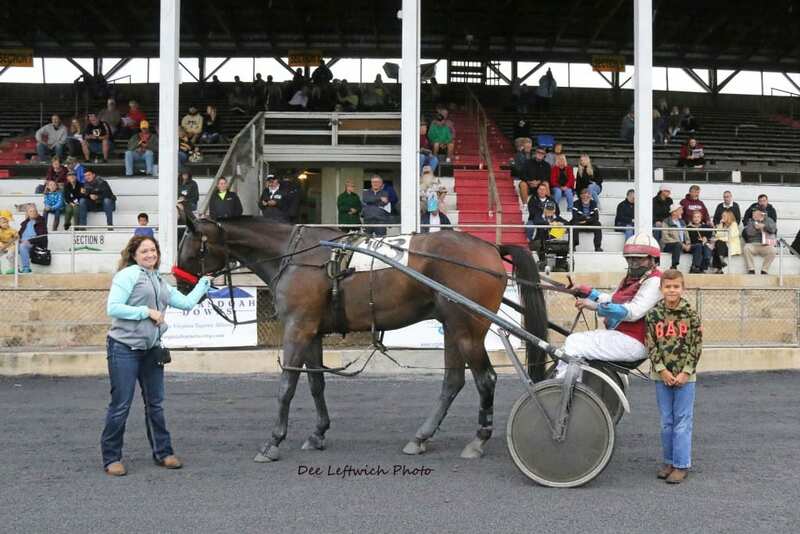 Not only did Miller capably guide his five-year-old gelding trotter past Explosive Bubbles and Fins Up in the stretch, he was sent off as the 3-2 betting choice in the six-horse field. Hay George was third throughout the early going and crossed three-quarters of a length the best in 2:08.0 over a sloppy track. It was his first win in six lifetime starts. His prior victory actually came nine years ago in Virginia, at Colonial Downs, on September 16, 2009. The then-75-year-old driver swept both ends of a daily double that day with Mac Atack Mac and Second Hand News. Miller drove the latter to victory four times over a two-year period, including that final time in New Kent. During the same meet, he teamed with driver Jim Larente in what he believes is the oldest exacta — from a human perspective — in harness racing history. Larente, then 78, won a race with The Doctor while Miller was runner-up with Mac Atack Mac. MiIler’s path to Shenandoah Downs in Woodstock came as a result of rejection elsewhere. Miller is based in Dover, Delaware and has been in harness racing for 46 years. Previously, he was a tractor trailer driver while his wife always tended to the horses. He plans to keep on competing with Hay George for the rest of the meet at Shenandoah Downs. Shenandoah Downs will continue racing every Saturday and Sunday thru October 14th with first post at 2 PM. The season’s highlight will take place this Saturday September 29th when Foiled Again, harness racing’s top money-earning horse ever, will compete in a $10,000 Aged Invitational Pace, then appear for a Meet & Greet session with fans. The 14-year-old pacer has bankrolled over $7.5 million in his spectacular career. He recently won his 103rd race and will be retiring at the end of 2018. Racing action from the Shenandoah Valley is streamed live at www.shenandoahdowns.com. Love stories like this one. Didn’t even know they had a Virginia harness track still going. 80 plus and still going strong… Keep up the good work horsemen and journalists!